MDS is a repository where we upload all re-usable artifacts; these artifacts can be WSDL files or XSD files or DVM, XREF files. We can have both design time and run time MDS. Design time MDS is file based where we keep all the artifacts in local file system, run time MDS is DB based where we upload all the artifacts in DB schema. We generally use file based MDS during initial development and later migrate to DB based MDS. MDS is really nice feature which we use for Oracle SOA suite but 11g version of service bus does not support MDS that means we can’t share artifacts between SOA and OSB using MDS so whenever we need to use the artifacts, we need to keep that artifact in service bus project only, we can’t use the artifacts which are referred by SOA project from MDS. This makes really difficult for developers to share the artifacts and this is major complain of most of the developer who works in OSB 11g. There are many new features introduced in Oracle SOA 12c. One of the features which I really like is MDS support for service bus; finally Oracle provided MDS support for service bus that means in 12c artifacts can be shared between SOA and service bus projects. Now we can use the WSDL which is there in MDS to generate business service or proxy service. In 12c there is concept of design time repository (MDS) which is similar to file based MDS, this design time repository is based on Java DB. There is one additional feature provided in Jdeveloper 12c for service bus that is we can also publish artifacts to design time repository from service bus project itself that means we need not to manually copy artifacts from our project to MDS file path. 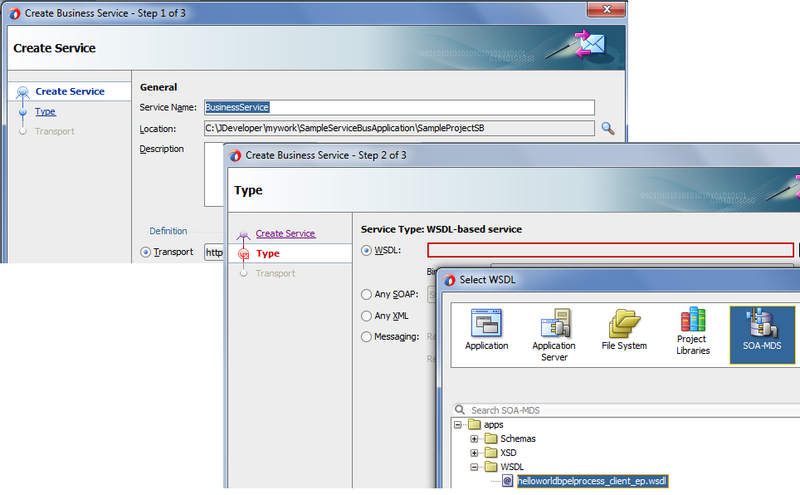 In this post, we will see how to use WSDL file which is there in MDS to generate service bus business service. To create the business service drag “HTTP” to composite pane. 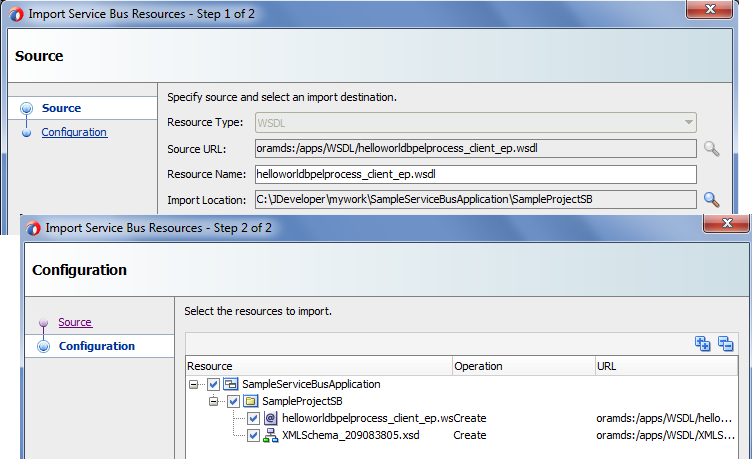 This will open the create business service wizard. In the step one provide the business service name and description, make sure transport is select as HTTP. Click on next, in the next step choose WSDL as service type and click on browse button to browse the WSDL file. This opens another wizard; this wizard shows different options from where we can select the WSDL file, in our case WSDL file is there in MDS so we choose where you can choose SOA-MDS. Go to that WSDL path and choose that WSDL. This opens another Import service bus wizard. In the step one you see the Source URL of the WSDL is pointing to MDS. You can change the resource name if you want to, click on next to go to next step. In next step, you can see all the resources which will get added to your project from MDS, you can de-select the resource which you don’t require, once done click on finish.